Park rangers at Hawai‘i Volcanoes National Park rescued a lone hiker Thursday morning who was stranded on Mauna Loa after a winter snowstorm pummeled the summit and lower elevations with heavy snow and high winds. 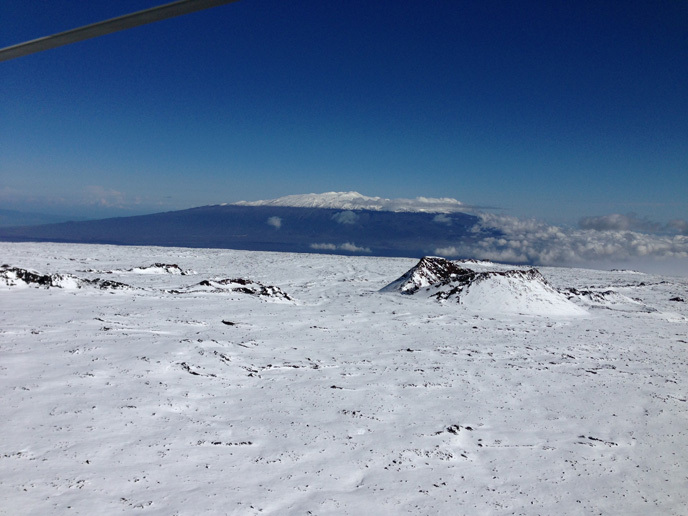 Photo courtesy of search-and-rescue pilot David Okita shows snow-covered Mauna Loa and the cindercone Pohaku o Hanalei in foreground, near where Sverdlov was spotted. Snow-covered Mauna Kea is seen in the distance. 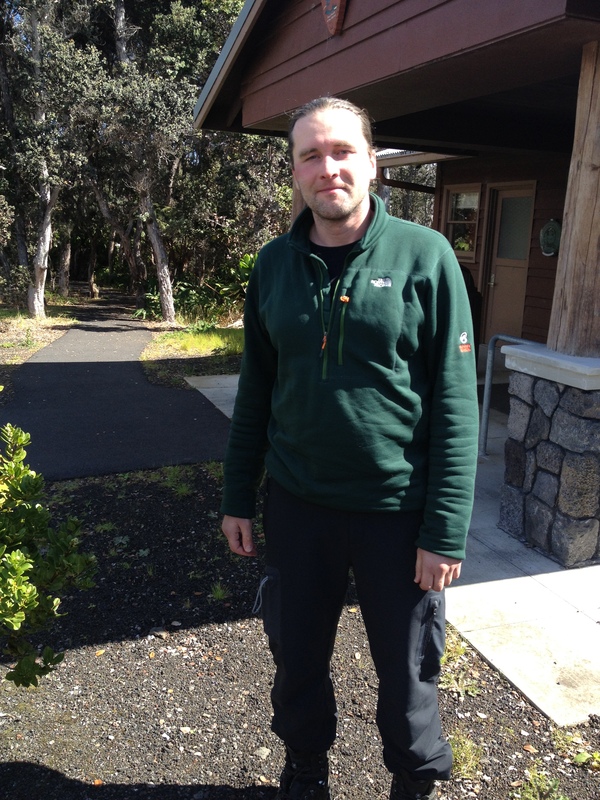 Last Sunday, New York resident Alex Sverdlov, 36, began the grueling 18-mile trek from the top of Mauna Loa Road at 6,662 feet towards the summit of Mauna Loa. He reached the 13,677-foot summit on Tuesday, after dropping off his heavy gear at a lower elevation. The snowstorm struck on his late-afternoon descent, creating a blinding white-out. Night fell, and after a few futile attempts to locate his pack, Sverdlov decided to hunker down in the snow until daylight. His only protection was the clothes he had on, and a bottle of frozen water. 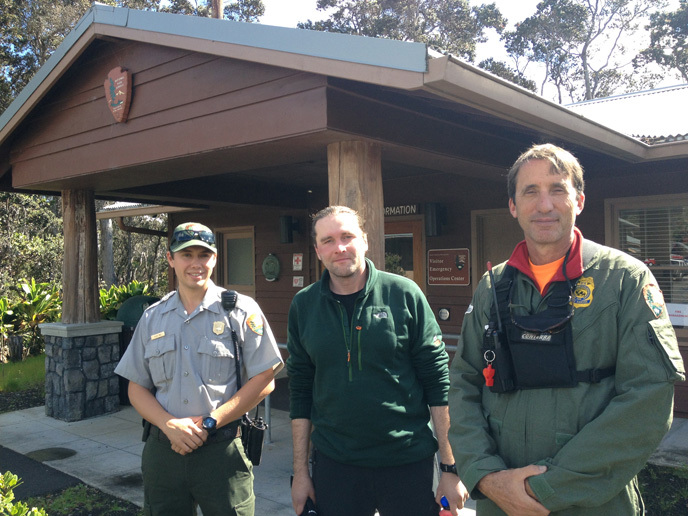 Rescued hiker Alex Sverdlov (middle) stands with his rescuers, park ranger John Broward (right) and park ranger Tyler Paul (left) outside the park’s Visitor Emergency Operations Center on Thursday. Earlier Tuesday, park management closed the mountain to visitors because of the dangerous weather. Sverdlov was the only registered hiker, and park rangers tried unsuccessfully to call his cell phone. They drove up Mauna Loa Road, and confirmed his car was there. When Sverdlov’s car was still there Wednesday afternoon, Park Ranger John Broward decided to search for him by helicopter Thursday morning. Sverdlov was located by 9 a.m.
“I’ve done many crazy hikes, but this one pretty much tops the bill,” said Sverdlov, an experienced hiker who successfully summited Mauna Loa last winter. After locating his pack Wednesday morning, the deep snow made it impossible to gain much ground, and he spent a second frozen night on the mountain. Sverdlov worried that he’d die on Mauna Loa, and was astonished when he heard the helicopter. On Thursday afternoon, his face sun-burned and wind-whipped, Sverdlov applied for another backcountry permit, for the park’s remote coastal area. “This time I’m going to the sunny part of the park,” he said.